People may view the construction industry as dependent on timeworn practices and slow to adapt to the modern world. But all of that is changing. Look at any large-scale construction project today and you’ll see that cloud technology is quickly becoming an essential part of the industry’s work. It makes sense that an industry with multiple worksites would leap at the chance to digitize its paper-based workflows. However, some of the ways builders are using the cloud may surprise you. The Internet of Things (IoT), autonomous vehicles and always-on mobile internet connections are rapidly growing in popularity. Consequently, on-premise solutions for storing and deploying data and applications are no longer practical options for construction companies. There’s no doubt that new technology solutions will continue to emerge in the coming years. Cloud technology has the potential to impact every part of a construction company’s work. Here are some of the key benefits that it offers. Reliable, grounded internet has not yet reached every place in which construction occurs. Just consider the large infrastructure projects in resource sectors like mining or forestry, or large transportation projects like highways or ports. The locations of these projects are often highly remote. Yet when you combine with the arrival of 5G mobile connectivity with the move towards blockchain-based cloud solutions, teams can use data and resource-heavy applications and services virtually anywhere. For many years, construction companies relied on traditional paper-based workflows for their inherent quality assurance, security, and reliable record keeping. However, the cloud is now more than capable of meeting and surpassing these expectations. This creates opportunities for workflows to be partially or completely digitized, thus eliminating the need to haul files and documents from site to site. Automation is a huge part of the digital transformation landscape, with machine learning playing an enormous role in optimizing workflows and predicting problems before they occur. Once they’re based in the cloud, many construction workflows can be automated or at least semi-automated. Tasks like ordering equipment, fuel and other materials to a worksite can be handled digitally, which reduces downtime caused by inefficient logistics planning. At the same time, big data is becoming more important in every industry. The cloud provides the scalable and flexible storage and networking infrastructure needed for the effective use of big data. Without the cloud, coordinated account and client management become nearly impossible for an industry with multiple worksites. 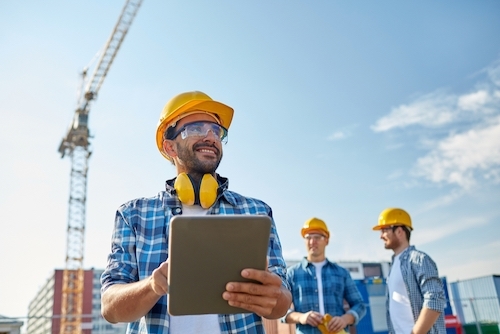 By making the most of cloud apps and their ability to host services and data online, construction firms can make sure they’re always prepared to meet their clients’ expectations. Construction projects are often lengthy endeavors. As such, firms must carefully manage their relationships with prospects and clients over long periods of time. It’s essential that they have a reliable system to keep track of contact information, communication history, and special requests. Enable team collaboration across multiple worksites — and much more. Furthermore, an effective CRM for construction will go beyond relationship management by offering some of the benefits described above, like workflow management and task automation. The benefits of cloud technology in the construction industry are clear. For companies that are looking for a competitive edge, now is the time to invest in solutions that can enhance your current processes and adapt to your future needs. Streamline your workflow with a construction CRM. Method:CRM integrates with QuickBooks to provide a complete overview of each customer and project, all in one place.